A number of years back I developed a visual model to express what I understood to be a ‘systemic’ understanding of partner capacity building, from the perspective of any organisation engaged in developing programmes of such work. The model attempts to express my understanding of the importance for organisations to frame their partner capacity building in a strategic manner, and take an approach which is coherent with a core set of values and principles. 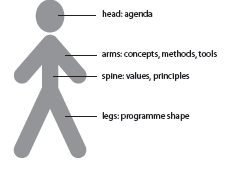 The image is of a human body, with the head representing the overall direction or ‘agenda’ – the reason why the organisation is engaged in capacity building in the first place. The arms represent the knowledge base, the conceptual models, the methods, tools etc. that are drawn upon in the work, and the legs take these to any one context where the capacity building work is designed and implemented. Holding it all together is the backbone of the organisational values and principles. I have shared this model with INGO staff and other participants of training courses on the subject, or with clients when engaged in supporting their capacity building efforts. Alongside the visual model is an accompanying set of ‘prompt’ questions, aimed at helping the process of designing partner capacity building programmes. Simultaneously, the model and accompanying questions aspire to be an aide to practitioner reflection – but always from the organisational and programming perspectives. 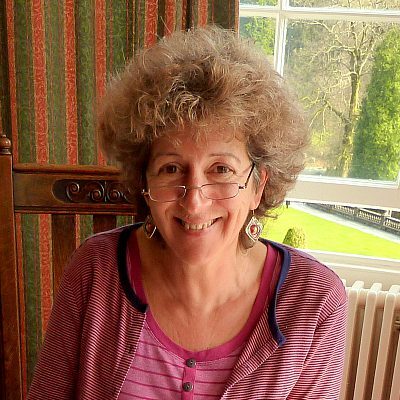 I have not used it at the level of the individual change agent – I have not asked course participants or clients to place themselves as individuals inside that visual image of the body, and reflect about how they are approaching their own practice. In my work with them, I facilitate reflections about how as individuals they operate in relation to some of the model’s components e.g. about the strength of their ‘arms’ (knowledge base, methods, tools etc. that they can draw on) or about their role as external change agents. But I have not worked with them on how ‘systemic’ they are in their practice. I have not prompted them to reflect on how their own personal values and principles (the ‘spinal column’) provide the connectivity with the ‘agenda’ behind this work they are doing; with the development of an appropriate knowledge base and methods that they can call on (the ‘arms’); or with the application of all of this in any one specific context (the ‘legs’). Why haven’t I done this? Is it about a narrative which is telling me not to push individuals into positions where they may be unable to reconcile underlying contradictions between their personal ideals and the organisational or programme imperatives? Is it about being ‘realistic’ and recognising that individual practitioners are constantly making compromises for the ‘greater good’ of the organisational mission or specific programme goals? Or is it that I have put this aspect of my professional work into a safe box – one which has the label of ‘organisational approaches to partner capacity building’ rather than a label which says ‘the messy world of individual change practitioners’?